Who's a knotty boy, then? I'm ramping up the exercise, and it's wonderful. Ran my first parkrun without stopping last weekend - it's only 5km but parkrun is a big psychological milestone for me. 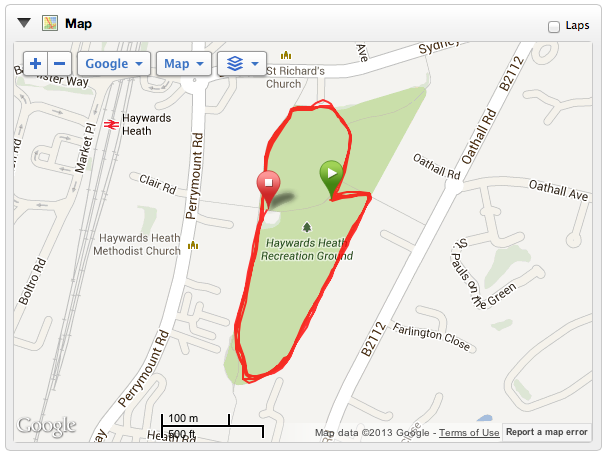 I went down to the inaugural Clair parkrun event Haywards Heath. It was an unexpected hill-fest - but I ran it all non-stop, and set a "comeback PB" (my personal best since coming back from injury) of 28 minutes and 29 seconds. A far cry from my 21 minute all time PB, but all in good time! 4 and a bit laps of the recreation ground - dizzy yet? You can see the hills in my heart rate, until it all just goes through the roof on the last lap! There were a few familiar faces there including some inaugural hunters, and parkrun team member and host of The parkrun Show podcast Danny Norman. Great to see you all again, it's been too long. I've been on a few bike rides too, including a 110km mission on my Time Trial bike - first time I've ridden it since Galway last year! I vowed that once my training ramped up I'd make sure I was doing the right things to stop myself just getting injured again. Part of my multi-prionged defence was to get strong, and Ben and Josh at Athletic Edge have been doing a great job getting me started down that road over the last month. Another tactic was to get regular sports massage, so this morning at 7am I turned up at SW19 Physio to get beaten up by Christine the chirpy South African masseuse. Mrs has been seeing her for quite a long time, on and off, and it was about time I tried it. When you come for massage treatment, our therapists will ensure your muscles are assessed, stretched and stimulated by using techniques of deep stroking, cross fibre friction and vibrations. Minor injury is by far the most common musculoskeletal problem. It can be extremely painful and may seriously affect a person’s occupation, sport or quality of life. If not treated properly at an early stage, a minor injury can sometimes lead to a more serious condition in the long term. Massage can treat the majority of such minor problems quickly and effectively. Injury prevention is another area where the importance of massage should not be underestimated. Massage is the only actual treatment that can be applied specifically to help prevent injury. This is not only in a sports context but also in terms of posture and stress. ✓ Pain reduction through increased circulation. Firstly it didn't hurt anything like as much as I was expecting - sure there were moments that made me yelp a bit, but for the most part I could carry on a normal conversation. I explained my background and how I got injured in the first place. She started by working on the left IT Band ("Wow, that's tight!") and then the right ("Oh my God, this one is even tighter!"). She found a few knobbly bits and gave them some attention. Most of the bits that really needed work were on my calf muscles and glutes. There were lots of gristly bits ("Ahh yes, here's one right here!") that needed attention. After that she spent the final few minutes on my back and shoulders, and packed me off with some advice about drinking lots of fluid today (apparently there's a lot of "stuff" that gets released from the muscles into your blood after a massage) and keep moving. The first few times I got up from my desk today I hobbled around like an old man. It's the evening now and I'm home and showered. Legs are feeling better, but apparently tomorrow they'll feel floaty light. I'm booked in again for the Tuesday after Ride London, and I'm already looking forward to it. 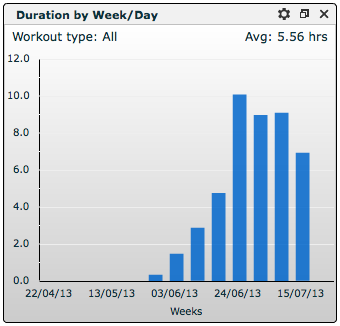 I'll aim to go every second week or so, but not too close to a race or heavy training session. Happy to be making positive pro-active choices about injury prevention. First race is this coming Sunday - Virgin Active London Triathlon, Olympic Plus distance - 1,500m swim, 80km bike, and a 10km run. Mrs will have lots of obligations over the weekend (more on that later! ), and I'm really looking forward to it. Can't wait! 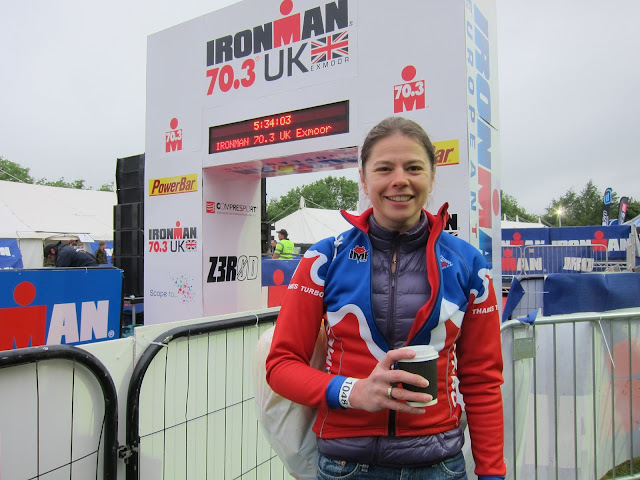 A couple of weekends ago I had the honour of taking Mrs to Exmoor so she could race the 2013 Ironman 70.3 UK event. 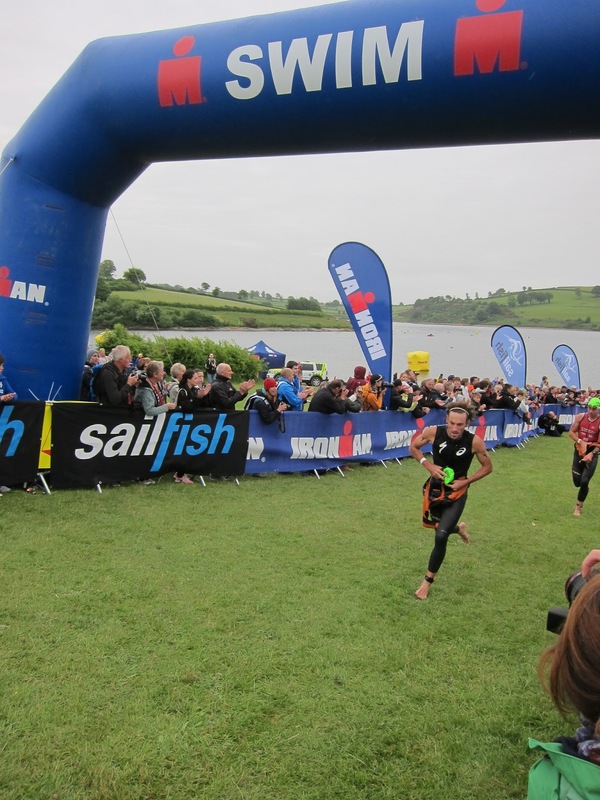 A swim in Wimbleball Lake followed by two hilly bike loops and a hilly trail run. Often called "the toughest 70.3 in the world" this was where our journey began last year. No racing for me yet, so this was an opportunity to see an Ironman event from the other side, as a spectator. We stayed at The Anchor Inn again, assured of a friendly welcome from proprietors Ann and John. Sat in the tiny village of Exebridge it's right on the boundary between Somerset and Devon and just a few miles from Wimbleball Lake, nexus of the weekend's Ironman 70.3 action. Ann and John had just taken tenancy last time we visited, prior to that the pub had been left to decay by the previous proprietors. They had big plans and it was lovely to see so much positive change in the building and grounds despite some of the work being catalysed by terrible flooding in the area last year. There were certainly more patrons than a year ago, and a good deal of local custom that was conspicuous by its absence last year - they're clearly going in the right direction. The drive down was uneventful - the car knows the way on its own now. Last year we were taking Thursday to Tuesday off work as the amount of organisation and recovery we needed was largely unknown. We decided fairly quickly that this year we'd do a more tactical strike and travel down Friday and return to London Monday to conserve precious holiday time. We stopped off at the lake to register on our way in and bumped into some old friends including many of the Ironman team we had met last year - Laura Beecroft (pro athlete liaison) was working the merchandise tent so we stopped to talk to her, Paul the race referee, and photographer James Mitchell who stayed at the Anchor Inn when he was covering last year's event for Ironman and Compressport. Kevin Stewart, Managing Director of World Endurance UK (the boss! ), pulled up alongside us to say "hi". 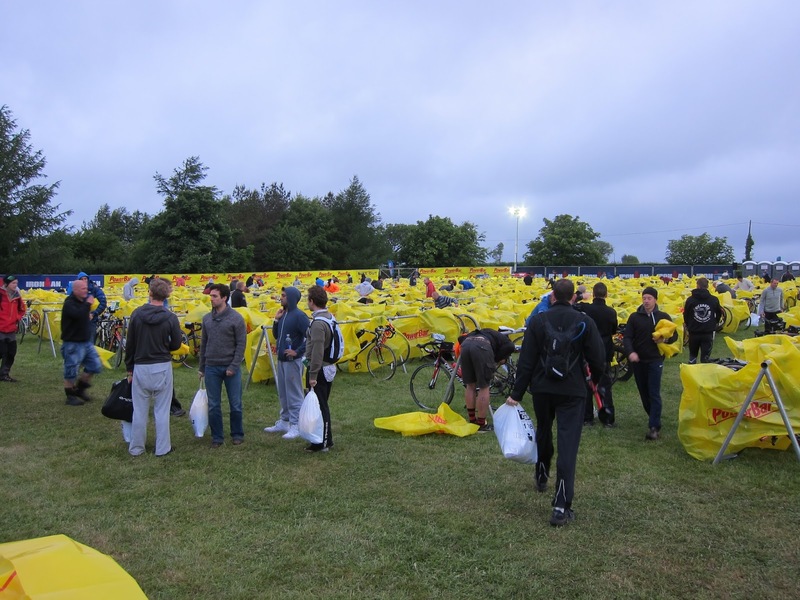 He was in a chatty mood, possibly because it was one of the rare moments without his earpiece chattering at him, and we discussed the commemorative bags they had secured for this year's 70.3 events. We concluded they were much better than the drawstring bags of last year. I was very pleased to see he drives an Audi, +1 for that. Friday evening we hooked up with Ironman MC Paul Kaye, his wife Kelly, Ironman announcer Joanne Murphy, fellow Ultimate Challengers and very experienced Ironman competitors Kate and Charlie Stannett - Kate made it through to the end, Charlie missed the bike cut-off at IM UK (I passed him at the end of my third lap and he still had one to go, and I was already six and a half hours on the bike). We were also joined by head Medic at the Ironman events Rob Ashton. I felt privileged to know these people (at dinner, and the ones we bumped into during the day) and spend some time with them. They are some of the key players in making Ironman work in the UK, and made us realise just how atypical our last year was. Going for the Ultimate Challenge got us well known, and some good friends in the process. Friday night and the pub was very loud until 2am. I remembered from last year and brought some earplugs - but I couldn't be bothered to fetch them. I hoped Mrs was sleeping OK - turns out she went off in moments and didn't hear a thing. Saturday was about a quick swim practice in the cold of Wimbleball Lake - I'm told it was warmer than it looks, but I wasn't convinced as I stood on the shoreline shivering. Mrs had packed her transition bags the night before, and we dropped those off and racked her bike. I sat in the café while Mrs went for the compulsory race briefing. Even though it was aimed at first-timers she went to the morning briefing - it saved us coming back later in the day. Weather was cold and increasingly rainy. Lots of nervous faces around. The forecast said rain for race-day, but not until mid-day. By that time Mrs should be on the run and weather would matter less. We had a wander round the expo, but it was fairly poor. It certainly feels like an afterthought with no real facilities for the exhibitors. Compared with the fully enclosed water and windproof tent that the Ironman merchandise shop was in, everyone else was quite literally out in the cold. It's a fair bet there will be bad weather at some point - can we get an additional big tent for smaller exhibitors to share? It was too windy and rainy even to talk to most of them, with everyone seeking shelter from the sudden showers. This is not a good experience for anyone. Saturday night was much quieter in the pub and we slept well. It was an odd feeling going to sleep the night before the race and not having any pre-race nerves. All I had to do was support my wife - pack her in the car, get to the start, and clap and shout encouragement. I tried hard to do as I was told and make the weekend as easy as possible for her. In retrospect it probably wasn't very fair of me to drink wine each evening - it puts her under pressure to join me. I'll try and be more understanding if I'm in that position again. Race-day morning was early - they always are. Mrs bounced out of bed energetically and started her routine. We were entirely self-sufficient for food, so no need to try to find breakfast anywhere. This certainly helps take pressure away from the morning, I'd definitely advise it in the future. We set of for the lake nice and early. There was very little traffic out, and only a short queue to park - just a minute or two. The parking directions were military in their precision - all weekend every trip in and out of the car park was expertly directed. Much better than the Rotary club team in 2013. At times the access road was made one-way, this greatly eased flow and was a good idea. There was a well connected team with STOP/GO signs around the T-junction on the access road all in radio contact who also did an excellent job. Mrs was in high spirits. The weather said it was going to hold. There's a lot of hanging around to do in the morning, and with no nerves keeping me on my toes (or in the porta-loos) it dragged on. Eventually we said our goodbyes and Mrs paraded down to swim start with the rest of her wave. She was off in Wave 2, 15 minutes after Wave 1 and the Pro field. I milled about and failed to get into a good place - I'm not too good at spectating! Wave 1 set off, and then Wave 2. I cheered but it felt a bit empty, I'd much rather have been out there bobbing around in the water, nervous and waiting for the off. I had a place right by swim exit so got to see a few of the Pros. It's hard to recognise people in wetsuits, but Tim Don was easy to spot - never cut your hair, Tim! Mrs didn't have the best swim, coming out in a shade over 40 minutes. 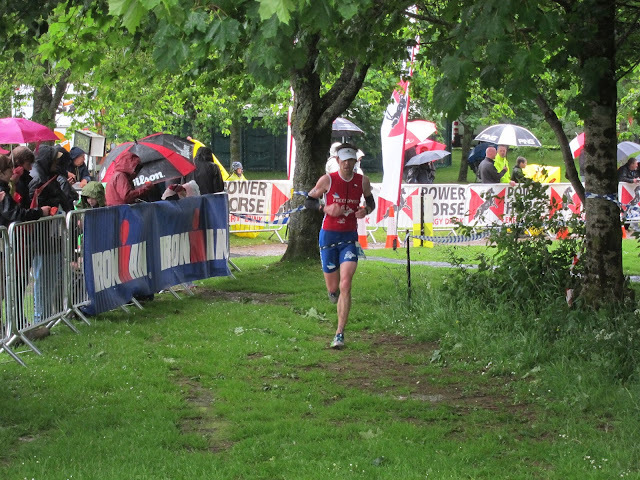 She seemed in good spirits though, and ran up the not inconsiderable hill to transition. I wasn't going to be able to get up there quick enough to see her bike exit, so I stood by the swim exit gantry for a while clapping the age groupers, and there were a lot still coming. I strolled up the hill and waited at the top to clap the last few - I missed Kate Stannett coming out, I think she got a good swim, but I caught Charlie. He said a few things to me but unfortunately my noise-cancelling headphones did a good job in cancelling his, er, noise (no offence, Charlie). Everyone had gone from T2 before long, apart from the couple of lonely bikes belonging to people who either DNS (Did Not Start) or had a bad swim, missing the cut off or not completing it. Time started slowing down now. I was wearing two jackets and two long sleeved tops, together with some long winter socks. I was still cold. The rain hadn't held off and about an hour into the bike we suffered short sharp showers. There was almost literally nothing to do. I wandered around a few laps of the site. The expo was just as poor as it was yesterday with no where to hide from the weather, and rather annoyingly not even anywhere to sit. Being a spectator here might be lovely when the sky is clear and the sun is shining, but it's much less fun in the rain. A couple of coffees and a cookie later, and I went to get a good spot to see the first Pros come in off the bike. It was getting colder and the showers were blending into continual rain as the first three came in - Tim Don, Ritchie Nicholls, and defending champion Fraser Cartmell. It was a good race, the three had been together for both laps and had cranked out a very good time in the conditions. Before long the first age groupers were in, and I was pleased to see Team Freespeed's Sam Baxter right up at the pointy end. 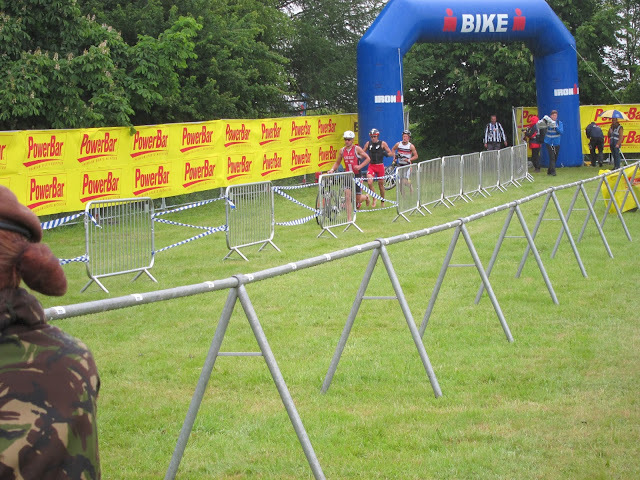 I got to know Sam at the Ironman UK training day in Bolton last year, he's a really nice guy and incredibly talented. Turns out he works a few hundred metres from me in London so we went for coffee last week. I'm all about the name dropping. I knew it was going to be a while yet before Mrs returned so I walked over to the run course for a bit. This was a real treat - to get to watch the Pros racing is a side of Ironman I've never seen first hand. 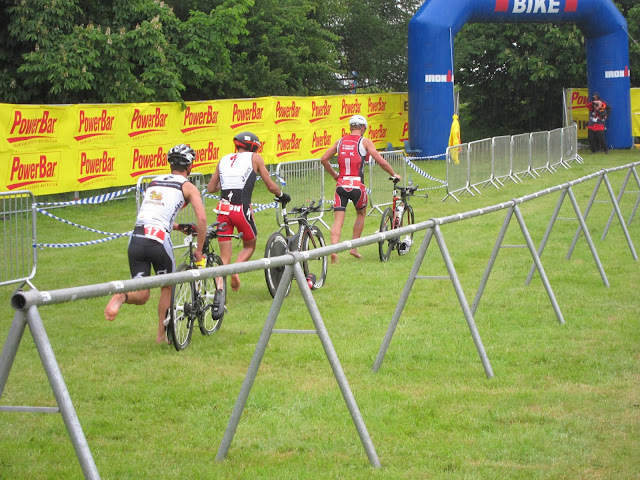 Last year I was coming into T2 as the men's race was being won! The athletes were getting progressively muddier and wetter as the rain fell. They were still putting in a hell of a performance though, it was a real battle up front with the race wide open in both the men's and women's field. Holly Lawrence, 4th last year, had stormed the bike going off the front to establish a lead, and defending champion Eimear Mullen from Ireland was chasing her down hard on the run. I heard a rustling behind me and was surprised as Mrs arrived already in her warm clothes and wrapped in a silver blanket. She'd had a very difficult lap on the bike, plagued by some mechanical problems, and had made the tough decision to not continue onto the second lap. She was in high spirits by the time she found me, but it must have been a very challenging moment. I feel she made the right call. Conditions were poor, and you need to rely on your kit - I learned that last year, I'm certain I'd have pulled up too if it hadn't have been the first of our Ultimate Challenge. We couldn't get her bike out of transition for another hour and a half, so we watched the runners for a little longer and then huddled in the café for what seemed like forever. We grabbed the bike as soon as we could, and went back down to the pub to lick our wounds (and drink some wine). Eimear managed to chase down holly and take the win. 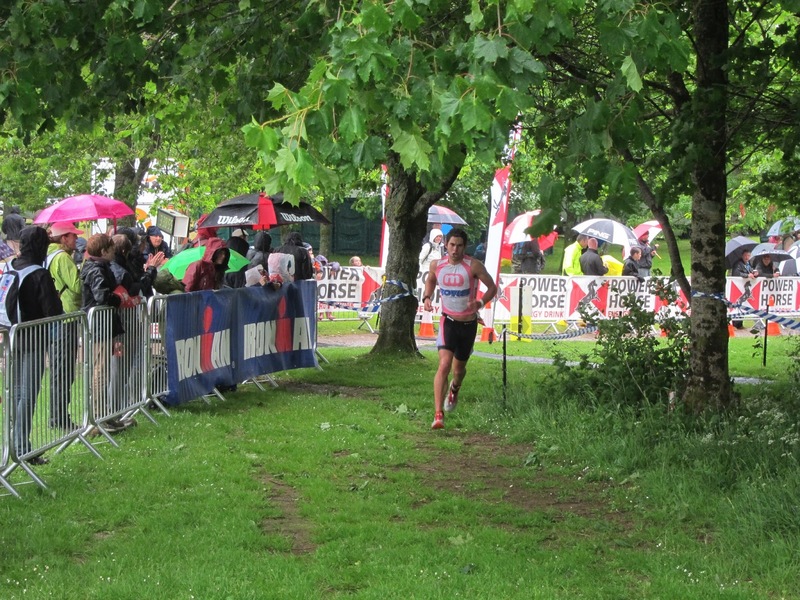 Ritchie Nicholls set an amazing new course record in sub-optimal conditions to take down the men's race. I enjoyed cheering on Mrs, I'm glad I could support her, but it's a sucky race to be a spectator at. The facilities are minimal, there's no mobile reception anywhere, nowhere to sit, and the expo is poor. The experience made me so very grateful for everyone who has cheered me on during my races. I didn't realise just how much standing around is involved, and how slowly the time passes! Thank you to my friends and family who supported me last year, and thank you on behalf of all athletes to all spectators - you're such a large part of the racing experience and you make all the difference, and I'm not sure how many athletes recognise your commitment. Of course, we've both already signed up for next year's event - with the world's toughest 70.3 on your doorstep there's really no choice! Bring on June 15th 2014 and with it the 10th anniversary of Ironman 70.3 UK.